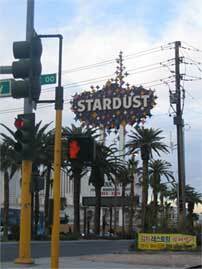 The $4-billion Echelon Place real estate will include the $2.9-billion Echelon Resort, wholly owned by Boyd Gaming. Echelon Resort will include 3,300 of the 5,300 rooms in two Las Vegas high-rise towers, each with its own casino, full-service spa, a pool area, two theaters and 25 restaurants and bars. Joint ventures will develop the rest of Echelon Place and include three additional luxury hotels, a 750,000-sf Las Vegas ExpoCenter, 200,000 sf of retail space, a few more restaurants, Las Vegas nightclubs and bars. 8,000 vehicles covered parking will also be included in this mega resort. Two of the Echelon Place Las Vegas hotels will have a 50/50 joint venture between Boyd Gaming and the Morgans Hotel Group for a cost of $700 million. Shangri-La Hotels and Resorts will manage the third hotel. Several partners have been contacted for the retail component. 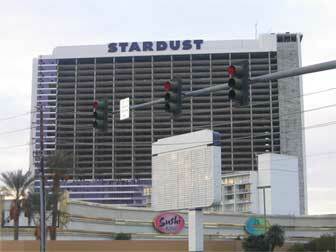 Source: Globe St.
Stardust Las Vegas ready for implosion to make way for Echelon Place Las Vegas.